Razer announced it will equip its Mambo and Imperator mice with a new proprietary 4G dual sensor system. The new technology uses both an optical and a laser sensor to deliver enhanced tracking accuracy. Razer™, the world’s leading high-end precision gaming brand, once again sets the bar for the absolute best in gaming technology with the introduction of their all-new 4G Dual Sensor System. Taking advantage of both an optical and a laser sensor for enhanced tracking accuracy, this sensor system was built to deliver the next level competitive edge in Razer’s line-up of highly popular professional gaming mice, starting with the newest incarnations of the Razer Mamba and Razer Imperator. Back in 1998, Razer pioneered the world’s first true gaming mouse and since then has been at the forefront of developing the most cutting-edge sensors, always staying ahead of the competition. Whilst all other mice in the industry performed at under 500dpi, Razer mice were firing at four times that, at 2000dpi and up. The tracking precision on any Razer mouse was and still is unrivalled. Razer is home to the greatest team of dedicated scientists and engineers, one eye ceaselessly trained on the prize to continually produce the greatest technology the world has ever seen or felt. With that goal in mind, and the validation of the top pro-gamers in the world, Razer is proud to unleash the next generation sensor for exceptional gaming mice performance. The 4G Dual Sensor System combines the best of both worlds - an optical and a laser sensor, to deliver twice the level of tracking precision. By allowing calibration of mouse to the surface you’re using, it is primed to optimally track your swipes more rapidly and accurately for the best in-game performance you can actually feel. It also lets you determine the cutoff height for tracking to stop when the mouse is lifted from the surface. This is especially important for gamers who pick up their mice to accommodate wide swiping motions, such as low sensitivity FPS gamers. 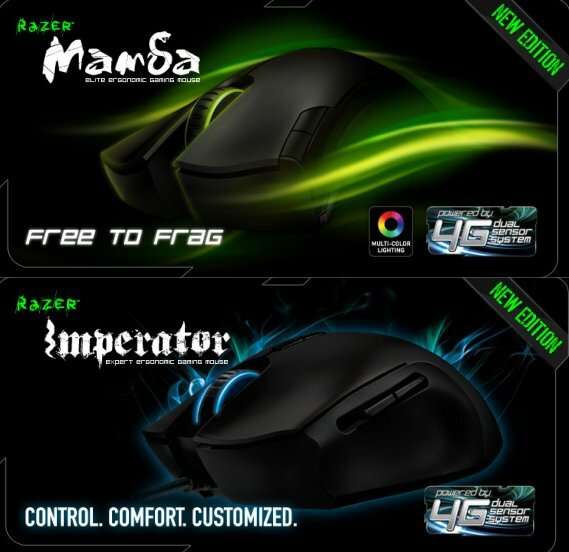 With a slew of new features like two sensors in one system, surface calibration, lift-off distance customization, and ten times faster surface detection than any sensor from the previous generation, the 4G Dual Sensor System in the new Razer Mamba and Razer Imperator reaffirm these gaming mice as unrivalled benchmarks for weapons of superior competitive-grade performance. The flagship pride of the Razer brand, the Razer Mamba harnesses everything that the greatest gaming mouse would need to take gamers to the stratosphere of win. Featuring a 2.4Ghz gaming-grade wireless technology for unhindered swiping freedom, an all-new 6400dpi 4G Dual Sensor System for blisteringly accurate tracking and customization of lift- off tracking distance, and longer battery life, the Razer Mamba makes legends of gamers who dare to strive for immortality.